Galbi jjim is one of the most popular Korean dishes. It’s made with beef short ribs and is often prepared for special occasions. 2 lbs (about 1 kg) of beef short ribs, water, cooking wine, soy sauce, black pepper, brown sugar, garlic, green onion, onion, sesame oil, carrots, radish, shiitake mushrooms, and mulyeot (corn syrup). Soak 5 shiitake mushrooms in warm water for about 4-6 hours. Soak short ribs in cold water in a large bowl for at least 30 minutes and change the water a few times. Boil water in a large pot. Put in the short ribs. Boil for 5-10 minutes. Take out the ribs from the boiling water and wash them with cold water to remove unnecessary fat or floating bubbles. Throw away the boiling water and clean the pot. Place the clean beef short ribs in the pot. Prepare a bowl to make seasoned water by mixing 2 cups of water, 4 tbs soy sauce, 8 cloves of minced garlic), ½ sliced onion, 1 tbs rice wine, and 1 tbs brown sugar.Add it to the short ribs in the pot. Boil it over medium heat for 20 minutes. Cut the soaked shiitake mushrooms into bite size. Open the lid of the pot and add all ingredients (carrot, radish, shiitake mushrooms) to the pot. Let it simmer for about 1 hour over low heat. Open the lid and check if the meat is cooked fully. Use your chopstick to poke the meat. When it is smoothly going through the meat, the meat is tender enough. Transfer galbijjim to a platter before serving. Posted on Wednesday, September 10th, 2008 at 9:07 am. Last updated on June 23, 2017. Posted February 24th, 2019 at 5:50 pm | Log in to reply. Thanks for the recipe! Still holding strong circa 2019! Posted February 27th, 2019 at 8:57 am | Log in to reply. Posted June 26th, 2017 at 6:45 am | Log in to reply. MAANGCHI MAANGCHI !!! I made this galbijjim !!!! I am 15 this year making this galbijjim for my family and its sooooo delicious!! Thank you for the recipe . Posted July 1st, 2017 at 11:06 am | Log in to reply. You are a cooking genius! Even though you are 15 years old you made such a nice galbijim! Posted December 24th, 2016 at 7:11 am | Log in to reply. Posted August 21st, 2016 at 8:26 am | Log in to reply. Posted May 28th, 2015 at 2:54 pm | Log in to reply. I made this for lunch today!! It was so delicious! I put some potato in it, it turns out a little bit mushy but it fits well with meat!!! The beef short rib is really tender and juicy with rich flavor in it!! Thanks Manngchi!! Posted May 30th, 2015 at 10:50 am | Log in to reply. Yes, it looks terrific! Thanks for sharing the photo! Posted May 17th, 2015 at 2:35 am | Log in to reply. 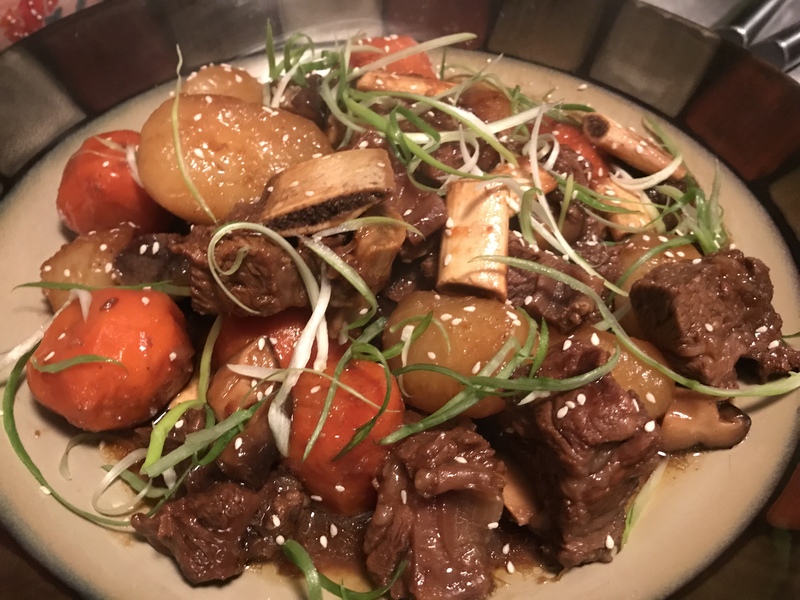 I am from Mexico … and I have made some of your recipes they are delicious, my family and I are very grateful with you for sharing your knowledge about Korean food!!! Tomorrow I will try this side dish Galbi Jjim… One question … What’s the name of the music/song in your video while you and your friend are preparing the Galbi Jjim ??? Your website is very nice and very professional … Congrats!!! Thanks and Regards from Mexico!!! Posted April 29th, 2015 at 10:40 pm | Log in to reply. Hi Maangchi, how many pieces/pounds of radish do you use? It does not say in the recipe or the video? Thanks! Posted April 30th, 2015 at 12:13 pm | Log in to reply. Posted May 4th, 2015 at 9:49 pm | Log in to reply. Ah okay. Thank you Maangchi. I will definitely try both of your recipes. They look so delicious! I will upload some pics after I make some. Thank you again. Posted August 25th, 2015 at 5:36 pm | Log in to reply. Posted September 24th, 2015 at 9:28 pm | Log in to reply. Hi aru103, thank you very much for the advice. How much longer did you boil it for? Posted August 30th, 2014 at 2:57 pm | Log in to reply. my mom told me that she rounds out (root) vegetables so that when they cook the edges don’t get mushy and keeps them evenly cooked (and handsome looking). Posted September 1st, 2014 at 2:09 pm | Log in to reply. Posted February 28th, 2014 at 10:59 pm | Log in to reply. 1. Instead of par-boiling the meat, I dusted the meat with corn start and browned them first. 2. Then I threw everything in the slow cooker and put it on Low for 6 hours (I read from another poster that’s what they did for the slow cooker). 3. After that, I put the entire thing on the stove and boiled it to thicken the soup. 4. Instead of corn syrup, I used molasses, because that’s what I had on-hand. I am ethnically Korean, but have never been taught to cook Korean food, and so I was so excited to find your site. I will definitely be trying more of your delicious recipes! Posted October 22nd, 2013 at 10:20 pm | Log in to reply. Is there a substitute to rice wine? Posted August 5th, 2013 at 1:02 pm | Log in to reply. Maangchi, I once had this pork kalbi when I went to Nepal for a holiday. The meat was thinly sliced like in your spicy pork recipe. And the bones were within the meat, thin and edible. Do you have a recipe for that? Or know how to make it? Posted August 5th, 2013 at 6:42 pm | Log in to reply. Posted June 22nd, 2013 at 7:43 pm | Log in to reply. If I want to use more short rib, increase amount of other ingredients? Posted April 29th, 2013 at 2:34 pm | Log in to reply. In one of the comments you mentioned this could be made using the crockpot. Should I set it on high or low? How long should I let it cook? Do I put all the ingredients in at one time? I love browsing your website for dinner ideas!! Posted March 11th, 2013 at 3:22 pm | Log in to reply. How many people does this serve? Four? Posted March 12th, 2013 at 9:37 am | Log in to reply. It will serve 2 or 3. This recipe was originally posted on September 10, 2008 at 9:07 am by Maangchi. It was last updated on June 23, 2017. The video was watched 253,069 times on YouTube & has 936 likes!